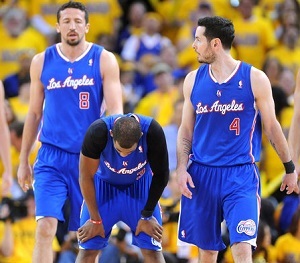 Hedo Turkoglu (left) scored three points in 13 minutes against the Warriors on Sunday. In response to racist comments made recently by team owner Donald Sterling, every player on the Los Angeles Clippers — including Turkish Muslim forward Hedo Turkoglu — dropped their warm-up jerseys at midcourt before Game 4 of their NBA first-round playoff series against the Golden State Warriors on Sunday to reveal inside-out t-shirts hiding the “Clippers” name. Players also work black socks and black armbands during the game. The English Premier League club is looking for a new manager after firing David Moyes during this disappointing season. Whoever gets the job next, writes Bleacher Report’s Paul Ansorge, would be wise to build the roster around Adnan Januzaj, the 19-year-old Muslim phenom from Belgium. The last Old People’s Champion of boxing, former heavyweight king George Foreman, believes it’s time for his replacement to hang up the gloves. “Get out and smell the roses,” Foreman says in a message to 49-year-old Bernard Hopkins, a Muslim convert from Philadelphia who unified the IBF and WBA light-heavyweight championships by beating Beibut Shumenov on April 19. Foreman became a folk hero to the middle-aged set when he won the world heavyweight title at 45 years old. He retired at 48, but admits he considered another comeback at 56 years old. Hopkins broke Foreman’s record as the oldest man to win a world title when he earned a light-heavyweight belt at 46 — and has since broken that record two more times. He plans to unify the three major titles in his weight class before his 50th birthday in January. Real Madrid’s superstar front line of Cristiano Ronaldo, Gareth Bale and Karim Benzema — basically the LeBron James, Dwyane Wade and Chris Bosh of international soccer — might not remain intact through the summer. Benzema, a French Muslim forward who recently helped Madrid capture Spain’s coveted Copa del Rey tournament title, is a wanted man in the international scene. Forty million pounds (approximately 67 million U.S. dollars) may be enough to move Benzema from Spain to England.